Family Law expertise and unwavering integrity have earned Kelly an excellent reputation in the Family Law community. Kelly's record of uncompromising ethics and personal attention instills confidence and trust with matters so important in your life. Kelly Gamble is a native of Oakland who has practiced Family Law in Alameda County since 2004. She is a member in good standing of the California State Bar Association and the Alameda County Bar Association. After working many years for various law firms, Kelly came to see the consistent exploitation of vulnerable clients by attorneys in their billing practices. Most commonly observed were attorneys billing for work performed by support staff, charging the client exponentially more than the task warrants, and rarely collaborating with clients directly. With a desire to develop an ethical, client-focused practice, rather than the typical exploitive attorney-focused practice, Kelly established her own Family Law firm in 2010. She works one-on-one with her clients while engaging in ethical billing practices. This creates transparency with work product and billing because the client is present for the preparation of their documents, and is only billed for actual time spent working on their case. As compared to other Family Law practitioners, this translates to more attorney contact and significantly lower fees. 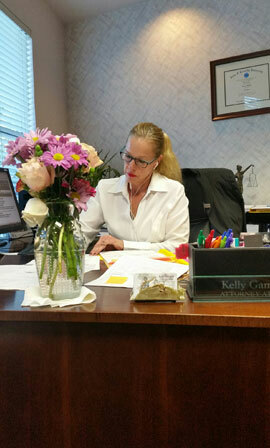 Kelly thinks of herself as a pioneer for the movement to stop attorney over-billing, inflated billing, rounded-up billing, micro-billing and phantom-billing which are all prevalent in the legal community. Kelly has a direct, no-nonsense approach which is not surprising considering she was a Sergeant in the U.S. Army before entering the legal world. I'm a proud mother to 4 boys including a step-son and a foster-son. Being a mother, step-mother and foster-mother, and having been raised primarily by my father, have given me life experiences which have graced me with a deep understanding of the complex, varied and emotional issues that are commonplace in Family Law. My husband and I are Army Veterans. We met in 1989 after I returned from a tour of duty in South East Asia. We both became Civil Affairs Specialists assigned to the 445th Civil Affairs Company, a little known unit under the U.S. Army Special Operations Command. I did not attend an elite or coveted law school. Rather, I attended a small, reputable Bay Area school, John F. Kennedy University School of Law. Their Juris Doctor program enabled me to attend afternoon and evening classes so that I could continue gaining experience through my employment as a Family Law Paralegal. My law school education was not paid for by my parents nor through grants or scholarships. Rather, I financed my own education and still have an outstanding balance on my student loan. For decades, I have had a near daily presence in Alameda County Family Courts giving me exposure to literally thousands of cases and dozens of judicial officers. This constant presence has provided me significant court experience where I have gained the knowledge and wisdom to present my client’s case in a manner that is well received. Additionally, I have established excellent working relationships with many of my attorney-colleagues. This is a huge benefit for the client because it avoids running up your bill by negating time-consuming posturing, expensive formalities and misguided power struggles. My experience and knowledge provide comfort and confidence to my clients because I am familiar with the courts, procedures, laws and the judicial officers who will be presiding over the case. I pride myself on my high level of integrity and transparency with my peers and the courts. I don’t claim to be perfect but I do my very best. One thing assured is that I will always give direct, no-nonsense advice. My suggestions and strategy will be based upon the law and the facts of the case—not the emotional level of those involved. Because of this, there may be a time when I have to tell you something difficult for you to hear, present unavoidable concepts which you may not have pondered, or present possibilities that you may not have anticipated. However, in doing so, you are being counseled and guided toward developing a plan of action which provides a solid foundation for resolving your legal matter and moving forward with your life by focusing on the “big picture”. It is my opinion that this is the most effective method of preparing you for the likely and realistic outcome of your legal issues, and to minimize the chances of conflict after the case ends. I'm generally regarded by my peers and judicial officers as a well-prepared, knowledgeable, and tenacious advocate who gets results for my clients. Yet, at the same time, I’m more commonly known for persistence with presenting reasonable and sound settlement terms in an attempt to save the parties’ from the financial and emotional toll of litigation. I’ve provided a detailed insight into my personal and professional backgrounds to enable those searching for a Family Law attorney in making an informed decision. It is critical that the attorney you select, whether to provide one-time advice, or for representation in your Family Law matter, is one that has relatable, real life experiences and one with whom you feel confident is going to provide sensible, well-reasoned guidance. "A good lawyer knows the law, conducts themself in a professional manner, and zealously represents their clients best interests. During the course of your legal matter, you will notice that I work one-on-one with all my clients. My work is not delegated to a secretary or anyone else, it is done by me. More often than not, your legal papers are prepared with you sitting in front of me. This method allows you to have direct input and involvement in your legal matter, assurance that your papers accurately reflect your position, and that you are paying for actual time spent on your case. Kelly Gamble is by far the best attorney I have EVER come across. I reached out to her in a time of need and she was amazing. Always kind, fair and honest. She never sugar coat anything and clear in explaining options, she always comes in court well prepared including her presentation, documentation, case homework, dress sense and more important is her confidence. It was a blessing that I found her and she is now considered my very good friend. Even now, after all has settled, she remains my family lawyer and anytime legal issues come up she is just a phone call away to advise and help walk me through the process. She deserves very high respect from me and I will never forgot, what she did to my case and I have no words. Thanks Kelly... Highly recommended.5 stars for you and your dedication to my case. Kelly Gamble is a wonderful attorney. She is caring, knowledgeable and through. Ms Gamble was able to settle my case quickly and in my favor. I know that going to court is never a sure thing, but she made it easy. Anyone unfortunate to go through a divorce, I would definitely recommend Kelly Gamble. After a 5 year custody battle with the mother of my child. I was left no choice but to find a family law attorney. I looked everywhere and found ms gamble. Her experience. Her being family oriented caught my attention. Kelly kept it 100% real with me from beginning to end. She is a real life saver for me and my family. I'm very blessed to have had her represent me. I would recommend Kelly Gamble to anybody. She works hard and fights for her clients. The ladies in her office are very professional also. Thank you ms Kelly gamble. You are a life saver. A dream come true. If there ever is an award.... You have my vote for attorney of the year. You are worth every penny and more thank you. First I must disclose that Ms. Gamble recently represented my Ex in our divorce. So, this review is coming from an adverse party. I simply want to say that Ms. Gamble was awesome and her staff is awesome too. About halfway thru our divorce I realized that I no longer needed representation(I can tell the truth as well as any attorney; maybe better than most). I let me lawyer go and represented myself. When I spoke with my attorney and told him that I was going to "Go it alone". He said, and I quote: "Mike, you'll come out just fine. Kelly is VERY ETHICAL and a good lawyer". He had worked with her on past cases. I remember when I was first served and went looking for a lawyer, I was asked again and again, "Who's the other lawyer?". Everytime I said "Kelly Gamble" the reaction was always the same....."She's a very good lawyer". Well, I found out for myself that she is indeed very professional. She very diligently, and all the while protecting her client, helped us work through the issues and come to a perfectly fair resolution. I know that my Ex was very satisfied with the services of Ms. Gamble's office. I was extremely surprised to see the negative reviews here on Yelp. I can only speak for myself and say that I have, and will, recommend Kelly to anyone who needs a good attorney.